The fields of seed corn have turned a shade of light rust as they wither in the sunshine. The soybean fields are still verdant and lush. The steamy sunrises have given way to cooler, misty mornings. The time of the Woolly Bear is nigh. Each September I remark on how early the geese are gathering for their flight south. I study the abundance of the local crops searching for anomalies. I look for omens in nature that will provide me with a sense of the coming season. It is with delight that I embrace autumn that will spur my nesting instincts. It is the time of year that I become most domestic. 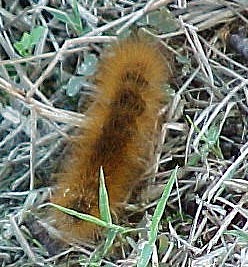 Yet the real harbinger of winter for me will always be the Woolly Bears. They arrive in all shades and bandings. Their proper name is Pyrrharctia Isabella. They are in the larval state of the Isabella Tiger Moth which is a medium-sized moth—one of the most common you will see as it covers all of the US down to northern Mexico. The moths themselves have orange/yellow/cream wings spotted with black. To me, the moths are pretty but unimportant. The lore of the land concerns the breadth and density of the dark bands. The wider and darker they are foretell a harsh and bitter winter. By the same token, the lighter coloring of the body and the more slender the darker bands will usually indicate a mild winter. Many this year seem without bands at all. Most are the normal brown-black, some brown-orange, and a few that are nearly blonde. This isn't uncommon, it's the norm. I was out early this morning and the only one I found was orange-blonde, no true banding in appearance. It reality its color attests to it's youth and not the severity of the coming season. Later in the day, the 'brown-blacks' were leaving the fields in droves as they shuffled and caterpillered their way across roads and yards. With them are the last of the cicadas as they sing, mate, and shed before another long season of sleep. The 'heat-birds' have extended their stay yet another season. In truth I yearn for the impetus to get me moving down the road of seasons into autumn. Fall, for me, is the very best season with its crisp, bright days and clean winds that wipe away the sluggishness left by a sweltering summer. It is a season of bounty as we fill our pantries and freezers against the coming of the cold and barren times. Food, warmth, and shelter become primary as we check our windows, insulation, vents, and fill our tanks with heating oil, propane, or open the lines for gas. If our homes are warmed by electricity, then we rarely feel ready—only a generator will suffice as peace of mind. It must be an ageless thing that we do, this preparing. We do it for safekeeping and the coming of the storms, the snow, the biting winds, and the bitter darkness. We also do it because there is a lurid, unspoken delight in being ready and safely hidden away from all else. To fulfill all my yearnings, I'll continue to watch the wanderings of the Woolly Bears and interpret them how I will. For be it one storm or many, the cold is coming and I'll be ready.